Our beautifully-designed hospitality board templates come with hundreds of customizable features. Every menuboard template is just a starting point — you can style it to look any way you want. 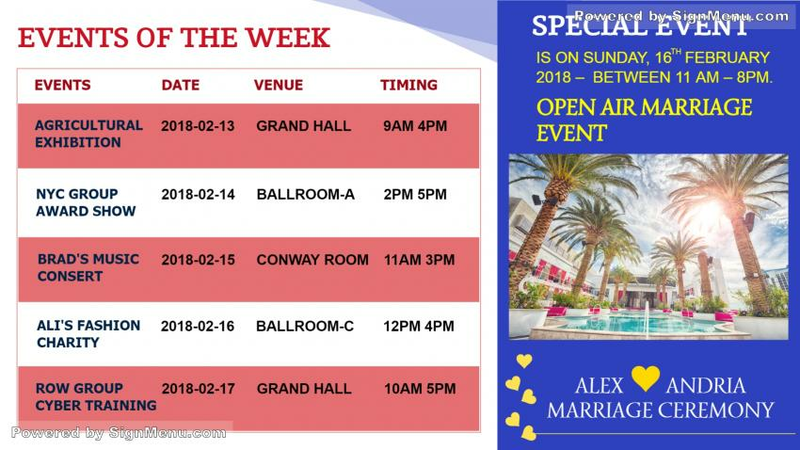 This template of a premium hotel showcases it's weekly event calendar. This is best presented on a digital signage screen indoors of the hotel ( at it's reception ) for all guests to see. These events mostly invite people from outside ie - from the city who register as delegates or participants to these events. The hotel hogs the limelight along with the guest speakers. Further, revenues for the hotel are additionally generated by the food & beverage servings on these events. This template is ready for download and use.